It's a dirty job, but someone has to do it. Yup, I've been working on cleaning out the oil from Lady Jane's bilge. This job was started in Fareham, where there was an oil disposal point just a short walk from Lady Jane, but that came to an abrupt halt when I filled the waste oil container up. 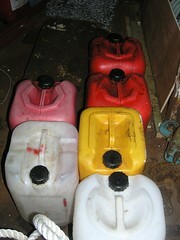 The oil in those containers you see represents the last of the easily accessible oil from the bilge. Now I have a load of thick smelly sludge in the bilge to deal with. This has obviously been collecting in there for years and years. I need to devise a method for getting it out, and disposed of. The shape of Lady Jane's bilge makes it really difficult to simply reach in and scoop out the muck. I think know this next phase of the job is going to be preceded by plenty of procrastination. 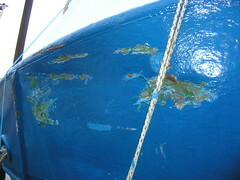 It's been nearly two years now since I finished the back deck project on Lady Jane. One or two patches of rust have started showing through, so it's time to do something about it. More rust etc. on the rails than anything really. But it seems that I'm only re-doing areas which were not thoroughly done the first time round. Still, a day spent rust busting and priming both the rails and the back deck is nothing in comparison to what I endured before. Also, no neighbours to worry about. Here the Queen Mary sets off for New York, after parading up and down past both the Queen Victoria and the Queen Elizabeth 2 in Southampton Water on Monday evening. Look here for a picture which gives you a better idea of her sheer size. This was very kindly stitched together for me by Anonymous, a regular commenter here. A replacement of my earlier effort. This meeting of the three queens is the last time they will all be together, so I just had to go down with Patch for a look see. On the water all about the queens it was madness, with small boats scattered everywhere. 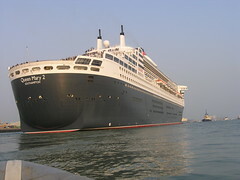 Jostling to get the best views as the Queen Mary 2 went gliding by. I note that some of the more enthusiastic boaters needed a bit of a reminder to stay clear. 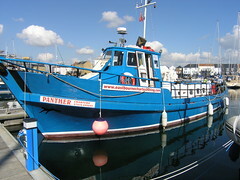 So this is the vessel that witnesses say hit Lady Jane. That buckling on her starboard bow is most likely from Lady Jane. 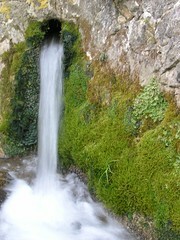 I went down and took this picture yesterday evening. While I was at the marina, I also spoke to one of the people who saw the accident. He said the Humber Star side-swiped Lilagina, then hit Lady Jane's stern with an almighty crash. That seems to fit with what I've seen. He also confirmed that the Humber Star did not stop to check if there was anyone on either Lady Jane or Lilagina who may have been hurt, or that the vessels were ok as a result of the collision. Aparently the only reason he did not report it to anyone is that he assumed that the Humber Star's master had reported the collision. 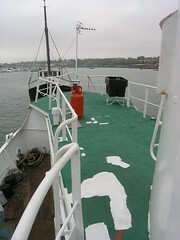 Going by the hungry horse look of the Humber Star's bow, I'd say that this is not the first scrape she has been in. All I know at the moment is that some unknown vessel hit Lady Jane sometime between Sunday evening and Tuesday evening - a space of some 48 hours. As soon as I got on board last night I knew there was something wrong. All sorts of things had fallen over or been knocked off their perches. Things that didn't even move when Lady Jane was travelling. Finally, after travelling around Lady Jane in the RIB I saw the damage that had been done and realised she had been hit from astern. The photograph does not give a realistic view of the size dent that has been made in what is 10mm steel there. Obviously there is damage to the woodwork etc. on the inside as well. The unknown vessel has also partially crushed the corner of my trusty wooden platform. It appears that Lilagina, the boat behind me, has also suffered some damage, though it appears largely superficial as Lady Jane seems to have taken the brunt of the accident. I have not checked yet, but will be willing to bet that the ABP mooring buoy has also suffered somewhat. I'd say this was a quite a substantial hit by a big, blue, vessel. I cannot imagine it got off with little or no damage either. I think it's appalling that someone can do this and not report it themselves. How would they know nobody was injured on either Lady Jane or Lilagina or, for that matter, how would they know they have not caused either vessel to sink somehow? I called Southampton VTS on the radio last night and reported this, and followed that up with a phone call today. They should have reported this. So I've finally managed to get the safety barrier in place in the engine room, it's the one you see at the back of the picture. This is something I've been meaning to do since before leaving Fareham. 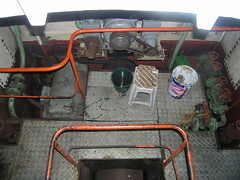 The picture you see is taken looking down into the engine room, from the deck above. 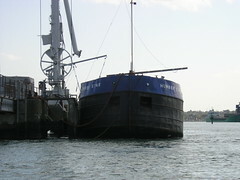 Originally the barrier was taken down as part of the project to replace the rusted through bulkhead, sometime in July 2005. In reality, by getting it back in place the only safety this barrier enhances is the fact that people are now no longer likely to trip over it in the engine room. Occasionally, when I'm in Lady Jane's wheelhouse, I'll have the VHF radio on in the background. It's usually tuned to channel 12, which is the Southampton Vessel Traffic Services radio. From the radio, you can get a pretty good idea of that is going on in and around the port without too much effort. On Friday evening, I heard the Ventura was about to set off on her maiden voyage to Barcelona, with over 4000 passengers and crew on board. 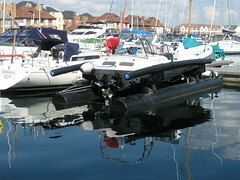 Given I had a full tank of fuel for the rib and nothing else in particular to do, I took the rib down to Southampton Water to have a look see. Unfortunately my pictures came out very shaky, on account of the dark and the movement of the rib. The very short and shaky video clip is here. Still, the sight of that leviathan ship passing in the night like that is something to behold. 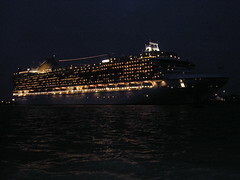 The Ventura is not the biggest cruise ship in town either. I was the only spectator out in a small boat, which warranted a visit from the attendant police patrol boat. I suspect more out of boredom than due to the fact that I represented any kind of threat. Further down Southampton Water, we were treated to a fireworks display. Put on to commemorate the Ventura's maiden voyage. Next we have the three queens meeting in Southampton to look forward to. I have news from Tony, up in St Anthony, Newfoundland. I met Tony when I was up there with the Wanderbird last year. 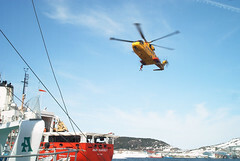 "Here's a picture I shot today....the coast guard picking up someone off their ship Ann Harvey. Ann Harvey was the Grace Darling of Newfound land, you know the Grace Darling story ??? Spring is here.....70 % of the harbour is still covered with ice 2 feet thick. Still good for cross country skiing, riding on snowmobiles and ice fishing. There have been a few polar bears passed our town, one hung around. They had to close the ski trails a couple of days. We see bears every spring at this time." It seems there is so much contained in what Tony wrote, the Ann Harvey story in particular. Hopefully I'll get back up to that part of the world with Rick & Karen in the Wanderbird later this year. One so simple, but so effective. All you do is let the air out of the dock to launch your RIB (HBI), then pump air back into the system to lift the RIB out of the water again. Apparently not that much pressure is needed, so one of those small electric pumps can easily do the job. All the advantages of having your boat out of the water, with none of the hassle of loading it onto a trailer, or having it hoisted out of the water all the time. Now it's spring, I thought "what could be more appropriate than a picture of a spring?" Click on the picture for a better view. Taken on a recent day out. With the weather improving, now it's spring, I can crack on with some of the outstanding deck projects. Number one on the list was to re-instate the nav light and aerial which got blown down during one of the more frisky winter storms here. Once again Andy, Rob, Lee and Steve's handiwork stands proudly upright. Splicing - how hard can it be? I need a loop spliced in the end of this rope. The plan being I can attach a shackle between this and the end of my anchor chain, so extending the length of line I have available to anchor if needs be. 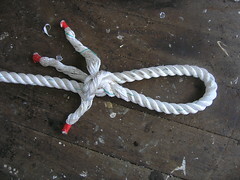 A spliced loop is needed, as a knot will not go through Lady Jane's hawse pipe. Anyway, I thought to myself, how hard can a splice be? The picture shows how far I got before breaking the fid I had. Truth be told, it was all going wrong before then anyway. It all looks far easier to do in the pictures than it is in real life. This is the point where I decided this is something best entrusted to a professional, at least until I've had more practice. No wonder when I mentioned to John, the skipper, that I'd try to splice that rope myself I got a kind of non committal answer. I was going to buy a dive compressor from this guy. Found on eBay. When it came down to it, the compressor itself was just too big to get out of it's nesting place and through either the door or hatchway. It was probably for the best, as I'd be distracted with a toy I'm just not ready for. Still a great day out weather wise, for a change, and a chance to take a few pictures elsewhere. Something I keep promising myself I'll do, but never get round to. 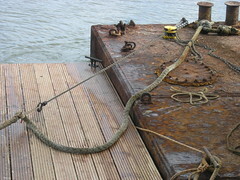 One of the crane barge lines which hold us to one of two mooring buoys parted. One parted line is not too much of a problem, as Lady Jane is tied to both the mooring buoys and the crane barge and the crane barge is normally tied on with two lines on either buoy. Still, with one line parted, there's inevitably more strain on the other lines. It took me a while to notice that it was a parted line which was responsible for Lady Jane lying slightly differently to normal. I re-tied the mooring line back up to the crane barge, but with the wind and tides there was no way I could get things back to normal by hand. No matter how hard I tried. The picture shows the cunning use of a prussic, a very handy knot learnt during the climbing things phase of my life, and my trusty chain block to persuade the combination of Lady Jane, the crane barge and Lilagina back to where they should be in relation to the mooring buoy. It all worked out nice and easy, and most importantly of all - safely. Unfortunately, one of the other crane barge lines now seems jammed underneath Lady Jane somewhere. 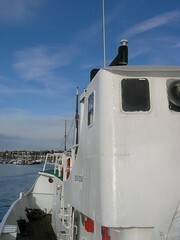 The result of the line being pulled behind Lady Jane on fast spring tides. Though I doubt it will happen, I'm hopeful that the line will work free of it's own accord. The alternative is a cold swim in the river with a sharp knife. We didn't get as much snow down Southampton way as other places in the UK seem to have had over the weekend. Ah well. It was enough to make everything look beautiful under a blanket of white, for a while at least. I love the fact that when it snows, it snows on everything. 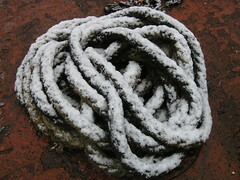 Ordinary things, like this piece of rope, seem to take on a completely different quality. A note to readers in colder climes - We are not that used to snow here in England, so it's fun to get snow once in a while. Not too much or too long mind. The picture shows the last of the insulation I've put in down below. 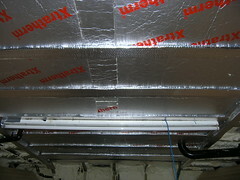 To cover the structural steel beams, I glued on some of that high tech insulation foil. Not that I hold out a lot of hope for the insulation qualities of the foil, at least compared to the other insulation I've been using, but I'm finding that covering any bare steel is pretty important in cutting out those annoying condensation drips. Next for the deckhead will be cable trays down either side, then the ceiling board itself. I've discovered these wonderful little LED lights. LED lighting has come a long way in the last few years. These come with a metal backplate and a magnetic strip. You can glue the magnetic strip to the back of the light and easily attach the metal plate, with the light on it, to wherever you want. This way I get the advantage of a fixed light, which can sort of double as a torch. 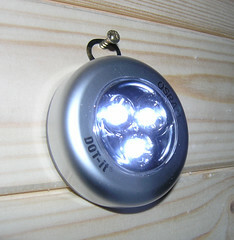 Though they are not a proper substitute for permanent lighting, with convenient switches, they are really cheap and are handy to 'dot' around the boat wherever they are needed. The one in the head, for example, has proved an enormous success.